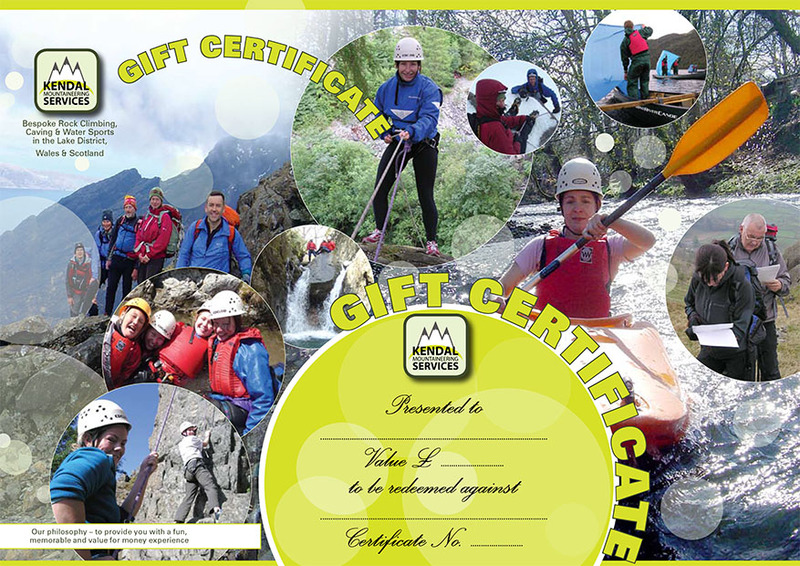 Outdoor Courses for Scrambling, Climbing, Kayaking & Mountain Activities: Buy the perfect Gift from us this Christmas. Treat your loved one, family member or friend to an amazing adventure or skills training course with us in 2017! Buy the perfect Gift from us this Christmas. Treat your loved one, family member or friend to an amazing adventure or skills training course with us in 2017! Christmas 2016 is now only a little over four weeks away! If any of your family are into the great outdoors, like trying adventurous activities; or have already been introduced to a particular sport such as Mountain Walking, Rock Climbing, Scrambling, Canoeing, Kayaking or Caving and would like to learn the skills to go off and do these sports for themselves - then you can help them experience these activities or learn those skills by buying them a Kendal Mountaineering Services Gift Certificate for Christmas! Payment for Christmas Gift Certificates can be done either by Cheque made out to Mr I Gallagher and posted to our business address (details on the Contact us page) or by Bank Transfer in which you'll need to contact us to be given the sort code & account number.Ideally, we also need an email address so that we can confirm receipt of your payment and then email you your Christmas Gift Certificate for you to print off and present. So what are you waiting for? Contact us today or call Iain on 07761483364 to arrange that special gift with a difference for a loved one, friend; or family member this Christmas. They won't be disappointed!